Despite its noticeable lack of a statewide lottery and few commercial casinos, Alabama or the Yellowhammer State as it’s also known, has a booming real money poker and gambling industry. Plus, in May 2015 Alabama government got a lot friendlier with the idea of regulated gambling; a new bill to bring casino games to the state’s racetracks and launch a state lottery was passed by a committee. The loosening up of Alabama gambling law also takes the state a step closer to regulating online poker. With Alabama government looking to fill a hole in their budget, they’re seriously weighing up the potential online poker and general gambling revenues that they’re currently missing out on. Back in 2011, the gambling industry in Alabama generated 25 percent more tax revenue than the year before – the largest percentage legal betting revenue gain in the United States. Alabama is still one of the top five states for gambling revenues. The state’s sudden explosion onto the gambling scene can be directly attributed to the aggression of the state’s only tribal faction, the Poarch Creek tribe. But is the tribe’s increased presence in Alabama’s real cash gambling scene enough to encourage state legislators to abandon their anti-gambling stance and consider an online gambling bill? Well, maybe. The prospect of regulated iGaming and online poker coming to Alabama this year is a longshot, but once the foundations of a regulated, commercial gambling industry are there, legal online poker becomes a whole heap more likely. If you’re from The Yellowhammer state and you’re feeling sure of your skill, you might like to try some of our top-rated real money poker sites for 2019. 2 Can Players from Alabama Play Online Poker? 3 Is Online Poker Legal in Alabama? In the past several years, the Poarch Creek Indians have single-handedly transformed the face of Alabama’s poker and gambling industry. In 2009, they opened the Wind Creek Casino and Hotel, a destination resort featuring over 1,600 electronic real money gaming machines, and a 160,000 square foot hotel. Then in 2014 they opened a brand new hotel and casino with over 250 rooms and a giant shark tank in the lobby. Now, in 2019 the Poarch Creek tribe are freaking out about the idea of legalized commercial gambling in the state and a potentially regulated online poker industry. That’s because they’d like to protect their profits and don’t want to lose their complete dominance of the gambling market in Alabama. In a desperate (and pretty clever) attempt to stop the Alabama government turning to regulated commercial gambling to fill the gap in the state budget, the tribe has put a deal forward. They’re saying, let’s create a pact together between the tribe and the government, which declares that the tribe are the only people allowed to offer regulated gambling in Alabama. These kinds of deals aren’t unusual but what’s different about this one is that the tribe are offering to pay the government one massive lump sum of over $250 million to cover the next five years, rather than $50 million each year. Because Alabama’s running out of money, this deal obviously seems appealing to state senators. Can Players from Alabama Play Online Poker? Alabama state officials tolerate the presence of tribal casinos not by choice, but by federal mandate. 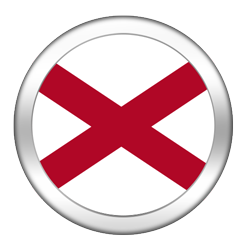 In reality, Alabama is a highly traditional state, historically opposed to gambling in most forms, including real cash poker. Yet, despite its conservative stance, Alabama does not prevent its residents from playing for real money at online poker websites in 2019. Actually, almost all the US Internet poker sites on our homepage are more than willing to accept real poker players from the Yellowhammer State. Just create an account with one of our many recommended poker websites, and you too can be gambling real money on the Internet from the comfort of your own home in The Heart of Dixie, Alabama. The truth is Alabama’s gambling laws are old and out-dated, as well as being massively vague. Right now in 2019 the laws just aren’t specific or modern enough to completely and clearly define Internet poker as illegal. Plus, never in the history of AL State has someone faced a criminal charge for merely playing online at poker websites. Instead, it seems Alabama state officials are more concerned with those operating an illegal gambling ring, and not those gambling real money on Internet poker tables in 2019. Real cash gambling, as well as other terms related to gambling, are clearly defined by Alabama state law. By definition, a person engages in gambling if he/she stakes or risks something of value upon the outcome of a contest of chance or a future contingent event not under his/her control or influence, upon an agreement or understanding that he/she or someone else will receive something of value in the event of a certain outcome. Note that the definition only applies to games of chance. Thus, real money poker players in The Heart of Dixie could conceivably make an argument that they are not engaging in gambling activity by playing online poker in 2015, by definition of the law. However, way back in 2007 Alabama Justice James Gregory Shaw stated that an offline and Internet poker player’s understanding of the rules or the laws of probability relating to a game of chance does not change the fact that he is playing a game of chance. His statement implies that Texas Hold’em poker would in fact be considered a game of chance and thus would fall under the Alabama state’s blanket definition of gambling. Promoting gambling, in other words profiting from poker gambling or other betting activities as a non-player, is subject to harsher penalties (Class A misdemeanor). Because Alabama’s gambling laws are so vague, Section 13A-12-17 Possession of a gambling device, could be read to include a computer used for online gambling. For more details regarding Alabama’s gambling statues  and the state’s 2019 legislative information in general, please refer to our “References” section. Compared to states where the gambling industry has thrived for decades, New Jersey and Nevada included, Alabama’s legal gambling history seems rather uneventful. In the days following the American Civil War, the state legalized lotteries. However, due to competition from neighboring states, the lotteries failed to generate much in the way of sustainable real money revenue and were banned. And by 1901, all games of chance, including poker betting, were deemed illegal by the AL state Constitution. During the Great Depression of the 1930s, Phoenix City went bankrupt, prompting city officials to grant lawful gambling licenses. Unfortunately, organized crime leaders caught wind of this, and began setting up shop. Crime rates rose dramatically, leading to the eventual assassination of an Alabama conservative Attorney General in 1954. For the next several decades, law authorities cracked down on poker gambling and other betting games and public sentiment towards gambling remained negative until the 1970s. It was then that AL state legalized pari-mutuel betting. Legit real money dog races have remained a somewhat popular mainstay of Alabama culture ever since. In 1980 charitable bingo gambling was legalized. Eight years later, the federal government passed the Indian Gaming Regulatory Act of 1988, which allowed Indian tribes to be recognized as sovereign nations, and thus exempt from certain state laws. The Poarch Tribe quickly took advantage of this clause by establishing electronic gaming halls in their territories. However, the tribe is not permitted to spread casino style table games in its facilities, including real cash poker. Besides the state’s three tribal destination resorts, residents of the state of Alabama can participate in charitable bingo and pari-mutuel wagering but not land based legal real money poker. Currently in 2019, the state boasts three major dog tracks with legal, regulated pari-mutuel betting (Birmingham Greyhound Racing, Greentrack and Mobile Greyhound Park). Right now Alabama is one of only seven states in the USA that doesn’t have a state-wide lottery and commercial casinos that include Texas Hold’em poker tables. The good news for poker fans is that thanks to the 2015 gambling bill due to go in front of the full state senate, by this time next year live poker and regulated gaming could be a reality in AL. Poker players in Alabama can play at many different online poker sites enjoying all of the action they want at any time. Despite its accelerated growth, Alabama’s lawful poker and gambling industry is still quite small even in 2019. And although there is support for legal online poker and regulated gambling, most of Alabama’s state officials would like things to remain the way they’ve always been. That’s why the general consensus among regulated iGaming advocates is that Alabama’s state legislators are unlikely to pass a bill legalizing Internet gambling and poker websites in 2019 but they are closer to it than they’ve ever been before. If the Poarch Creek tribe pushes for an online bill, Alabama lawmakers will have to listen but the majority of them are likely to reject any proposals for real money Internet poker sites and real cash casinos. In the past, experts have also said that the state might even opt out of a federal bill legalizing online gambling, should it be passed. Now in 2019, the senate’s due to look at regulating live gambling and if they approve that it’ll be clear that the government’s softened their position on gambling. In 2013, poker playing Professor Corey Harrison of Bessemer, Alabama won the WSOP Event #24 poker tournament ($1,500 No Limit Texas Hold’em). His reward for outlasting a gigantic field of over 1,700 runners would be $432,411  in cold-hard real cash. Harrison has a Ph.D. in cellular molecular biology and is a staunch believer that poker gambling is a game of mathematics and skill. Alabama used to be amongst one of the 10 states in the US that were least likely to pass iGaming legislation, making online real cash poker betting legal. That could all change later in 2019 though, because the state is running out of money and gambling revenues would really help. Plus, when the senate gets the opportunity to vote on a bill regulating live gambling, we’ll all get to see what Alabama’s 2015 position on real cash gambling is. The perfect combination of circumstances that could lead to the launch of regulated Alabama Internet poker rooms would be; the voters electing liberals, the iGaming market defying expectations and neighboring states such as Mississippi and Georgia passing Internet gambling legislation relating to legit real cash poker websites of their own. Personally, we don’t think that’s going to happen super soon but with the financial pressures rising in AL, legal online poker and regulated commercial casinos could solve a lot of the governments problems. That’s why we’re saying “Never say never” when it comes to legalized Alabama online poker.